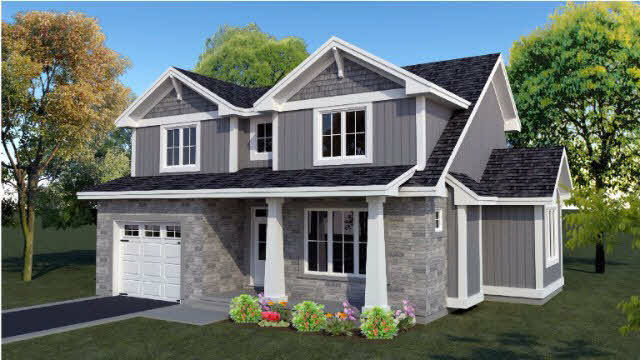 to be built by barr homes. the watson. a two story home with plenty of curb appeal and exterior design flexibility. this unique design has plenty of space for family living with three bedrooms and two and a half baths. choice of nickel or oil rubbed bronze finishes, up to 2 interior paint colours, choice of exterior colours and materials, upgraded kitchen standards with crown moulding and light valance, under cabinet lighting, custom ceramic tile showers in ensuite bath with glass doors, 5 1/4 inch base and 2 3/4 inch casings, stoop and apron window casings, your choice of interior door styles, hardwood and ceramic on main floor, 9 foot ceilings on main floor, limited lifetime warranty on shingles, code blue waterproofing, fully eavestroughed around house, engineered floor joists, subfloors glued and screwed, hrv and on demand hwt, paved drive.